Food policies, are the policies that you are trying to add into your life at any given time. They really could be any improvements that you want to make in your life. On this site, you have been trying to figure out your unhealthy diet habits that weight you down, and healthy diet habits that you can develop instead. Once you have these healthy diet habits planned, you then develop Lifestyle Solutions, or steps that will help you make these changes. It is hard to change all of your food habits at one time. It is helpful to start by making three small changes each month. As one habit is conquered, you can choose a new one, and work to eradicate that one too. I would encourage everyone to develop a list of policies that you are aiming to practice in your life. We are all different, and no food policy list should look remotely related. It is simply a list of the healthy diet habits that are the most helpful for you to concentrate on! These would be the areas you most often fail in. It’s your personal cheat sheet of action items that will improve your health! Pin in on your refrigerator or bathroom mirror as a daily reminder! An opportunity will be given below (coming shortly), for you to share your own personal food policies with us, and become part of the website. It will be interesting to see other's policies, and may help you to develop a great list of policies, by seeing what other's are doing. Flip my calories, and try to eat most of my calories in the daylight hours. I feel better this way. Eat smaller meals, and 2 healthy snacks, rather than grazing to keep my blood sugar more balanced. Remember that big meals spike my blood sugar, and I get hungrier. Eat breakfast when I first get up to speed up my metabolism, and I will eat less later on. Work on not eating after dinner. Use strategies from my list of "things to do besides eat", if I am struggling. I do not want to be a night time eater! Pay attention to whether I am emotionally or physically hungry, and practice eating until I am satisfied and not stuffed. Don’t deprive myself of the foods that I love, but eat them in moderation with no guilt attached, and be flexible. Use the half plate rule, and make sure I prepare enough veggies and salads to fill our plates half full. Know proper portions for the main foods that I eat, and choose wisely most of the time. Use my restaurant/fast food phone app for the restaurants I visit. Cut out all white stuff and most processed foods and eat whole grains at dinner. Ditch the empty calories most of the time, because there is no place where they fit in my meal plan. Be in touch with my feelings, and do not eat when I am emotional, but solve my problems rather than eating through them. Check out markets for lower calorie foods that I love, great food substitutions, if I do not want to do without them. Safeway angel food cake with strawberries and cool whip free is an awesome sweet substitutions, and only about 150 calories. Try and walk for 30 minutes per day, and do weights 3x per week. Take Calcium and Vitamin D daily. This is a simple list, but it has a Lifestyle Solution for almost every unhealthy diet habit that I struggle with. 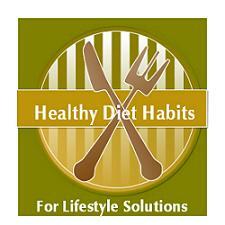 A great healthy diet habit, is to develop your own personal policy list, as you read this site. It takes a lot of pressure away, to know your food policies, rather than having to make the same difficult decisions, and face the same struggles, over and over again. After you have your policies in place, it is time to come up with your Eating Philosophy!